Savannah Dupree is halfway across the country from her Louisiana bayou hometown, a freshman studying at Boston University on a full scholarship. But academic excellence is only one of Savannah's gifts. She possesses something even more remarkable than her quick mind and insatiable curiosity for learning. With a simple touch, Savannah can see an object's past—a skill that puts her life in danger, when her studies bring her into contact with a centuries-old English sword and the secret hidden within the blade's history: the vicious murders of twin boys by a group of fanged creatures borne of the worst kind of nightmare. He watches her from across the crowded dance club, a sensual black-haired stranger who stirs Gabrielle Maxwell's deepest fantasies. But nothing about this night—or this man—is what it seems. For when Gabrielle witnesses a murder outside the club, reality shifts into something dark and deadly. In that shattering instant she is thrust into a realm she never knew existed—a realm where vampires stalk the shadows and a blood war is set to ignite. Here, in the arms of the Breed's formidable leader, Gabrielle will confront an extraordinary destiny of danger, seduction, and the darkest pleasures of all. . . . I really enjoyed reading these books! The world was interesting, and I loved this take on vampires. It was unique, which I really love, and yeah, I just had to read more! Though sometimes the alpha male thing got a little annoying! 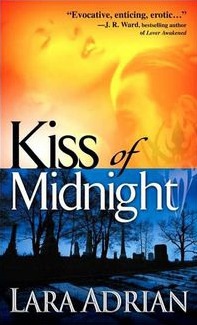 A Touch of Midnight was a really awesome introduction into this series! The fact that it's set in the 70's, yeah, that's different, and it was interesting to see how things have changed in the world! Not their world, because it's going to take more then a novella to change it! The vampires in this world, that they're descend from a group of aliens, yeah, that's pretty cool. That they are all male, and have to find a special human female to have kids with, yeah, it's different! The various safe places that each guy wanted/thought he had to send the ladies to, yeah, I didn't like that they would be forced to leave their lives, but having a safe place is a good idea! A lot happens in the first book. Like one of their own betrays them. And they discover a bad guy who might be around for a while, since he's a generation one and helped found the warriors. And is Lucan's older brother. Yeah. That was pretty intense and made for a great ending! These books were so great, and I can't wait to read more! 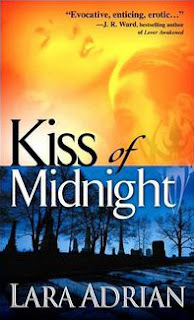 Reason Why: Sounded really good, and they're Prequel & Sequel Challenge 2018 Books and Kiss of Midnight is a WTC Book!